Before the new revenue recognition standards (“standards”) arrived, shipping and handling activities were typically considered fulfillment costs. Previously, any revenue earned from shipping and handling typically had to be matched with the revenue recognized from the related goods. Under the new standards, shipping and handling activities may now be a separate performance obligation in certain cases. The new standards described in Accounting Standards Codification 606, Revenue from Contracts with Customers (“ASC 606”) are here for public companies and it won’t be long before January 1, 2019, when ASC 606 will be effective for private companies as well. Companies should not procrastinate when it comes to preparing to implement the new standard. See our firm’s recent article, Four Steps to Prepare for ASC 606, to make the transition easier. An important matter that manufacturers and distributors will need to evaluate under the new standards, is the treatment of shipping and handling (“S&H”) activities that are fundamental to their operations. See Five High-Impact Changes Affecting the Industry for other significant changes impacting manufacturers and distributors. How many performance obligations exist in this sale to the customer? Does the S&H activity represent a separate performance obligation (a distinct service promised to the customer) or a fulfillment activity? When should the company making the sale recognize revenue on the S&H activities? Most of us agree that the sale of gizmos represents a performance obligation under both the old and new revenue recognition guidance. But what about the shipping costs the customer also has to pay? Is shipping considered a separate performance obligation that should account for a portion of the transaction price? If so, should it be analyzed separately for revenue recognition? As with so many issues in our profession, the answer is “it depends.” Under the old standards, S&H is typically considered a fulfillment activity. That means any revenue a company earns in connection with the S&H activity is typically matched to the revenue the company earns on the sale of the goods (the gizmos in our example). The company expenses the S&H costs as they are incurred. 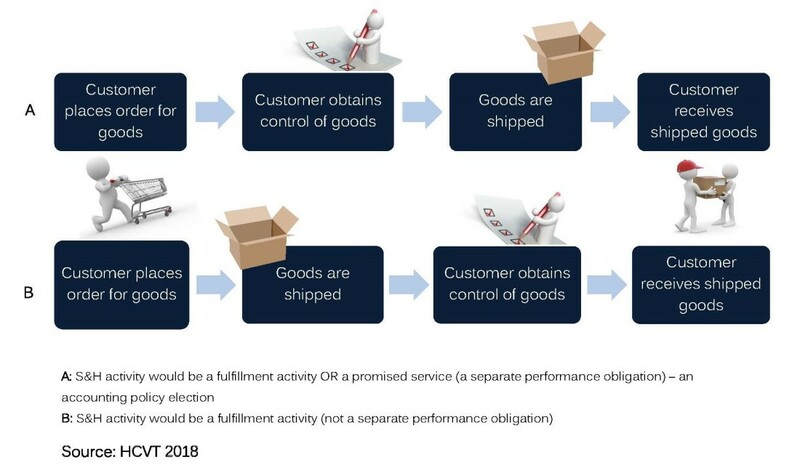 If control of the goods is transferred to the customer before the shipment occurs (e.g., Free On Board (“FOB”) shipping point), most entities would prefer to treat the S&H activity as a fulfillment cost, which is consistent with current practices. Entities would then need to accrue the expected S&H expenses after control of the goods is passed to the customer. The accounting policy election should be applied consistently to similar types of transactions. However, if an entity decides on the accounting policy election to treat S&H activities as a separate promised service, then this is a significant change in practice. Using our example above, many manufacturers, retailers, and distributors would not currently consider their sales to include multiple deliverables (i.e., goods and S&H). Therefore they may not have the systems, processes, and internal controls in place to account for such transactions as “multiple-element arrangements.” Further, this accounting policy election could result in two separate revenue line items, which may diminish the usefulness of the financial statements and may not add value for users of the financial statement. The Financial Accounting Services Board decided this decision should be an election, not a requirement, in the event that treating the S&H activity as a separate promised service is indeed applicable. Since there are many intricacies and nuances associated with the treatment of ASC 606, it’s important for private companies to examine their revenue recognition policies very thoroughly. Even in situations when revenue recognition appears to be straight-forward (i.e., shipping gizmos), companies still need to do some analysis to ensure they are in accordance with the new standards.